If you’re the type of bride who really isn’t interested in a white wedding dress, but you’re not sure about how a colored wedding dress would work, this post is for you. Check out these gorgeous colored wedding dresses that other non-traditional brides have chosen! This stunning mint wedding dress is pale in color, so it’s not too loud, but it’s definitely far away from the traditional wedding dress. Full of ruffles and luxurious sheer fabric, this dress is perfect for spring or summer. This dress color also pairs very well with a variety of other colors including peach, gold and purple. This pale peach dress shade is actually called “sherbet,” and it’s absolutely stunning. 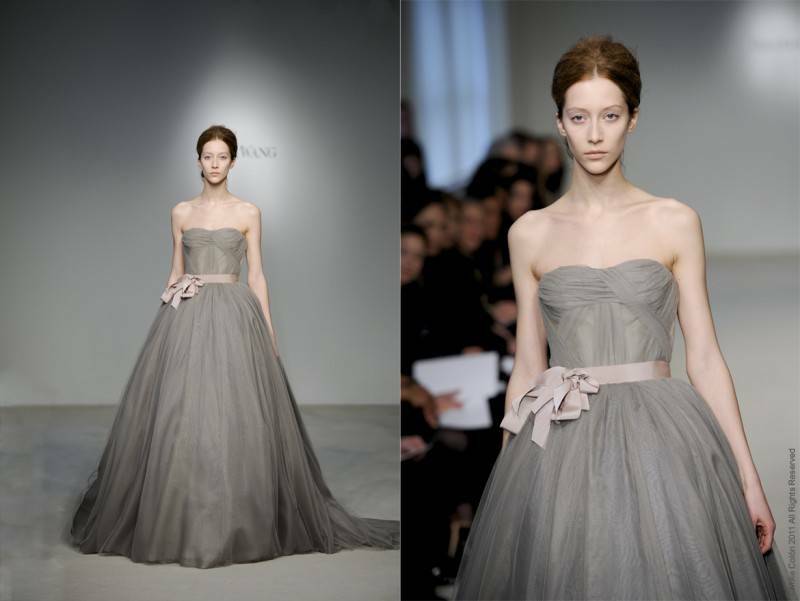 Another great dress for spring or summer weddings, it’s colored but not a drastic change from the traditional white dress. This one would look fantastic with coral, deep blue and charcoal gray. This gorgeous dusky-blue wedding dress is definitely eye-catching and just about as far away from the traditional as you can get. This color would look absolutely wonderful when paired with cream, pale blue and sage. The fantastic thing about gray is that it literally pairs well with every color: crimson, sunny yellow, coral, deep purple…the list goes on and on. If you thought gray was boring, think again. It can make a stunning and bold statement at your wedding and is perfect for all seasons. Gold is a super hot color in the wedding industry right now and more and more designers are creating gold wedding dresses. Luxurious and beautiful, gold adds a glitzy feel to the wedding. It looks great with tons of colors, too, like pink, peach, sage green and lavender. Each of these dresses is breathtaking, and just goes to show how truly beautiful non-traditional can be! The pale peach one is my favorite. Such a beautiful color!